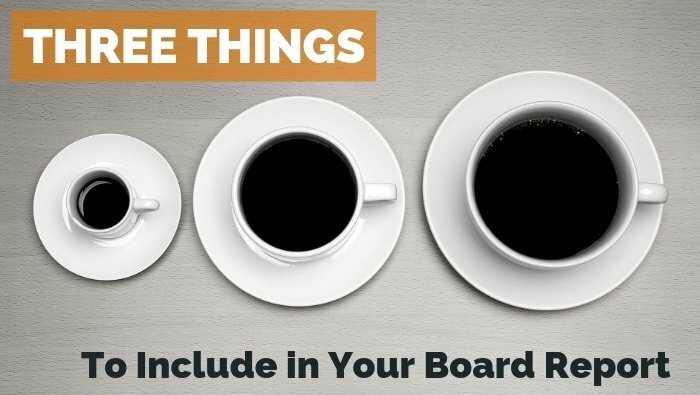 It can be overwhelming trying to figure out what to include in your board report. It can also feel like a challenge to compile your report if your board is made up of a mix of people from a variety of different sectors and they all want to see something specific from your board report. It doesn’t have to be a challenge preparing a board report. At the end of the day you can’t include everything in your board report and you aren’t meant to either. Before we get into the three things to include in your report, there are two tips to keep in mind while collating your board report. A board report isn’t meant to cover every detail of how your organisation has progressed. Instead, it is designed to give a summary of the past year, quarter or month. These highlights must give your governing body just enough information to make decisions and to guide it in its next steps. As conclusions will be made based on the information you provide, it is vital that you give your board the right stuff to read. The board members reading your report are busy and passionate people. Your board members will have chosen to be on the board because they care about what your organisation stands for and the difference that it makes in the world. As passionate people, board members will often be on multiple boards and committees, so they might not have time to read long reports before a meeting. Sometimes a board member may just get to reading it a few minutes before the meeting starts! Keep in mind that your board needs something that they can scan quickly. The more visual the better. If you have visual content in your report then they can glance at it during the meeting while you present it, giving you their full attention. So, to keep it very simple, there are three key insights that you must include in your board report. If you have these included, then you have given your board an overview that includes just the right amount of information for them to use. Any additional information that you cover will be a bonus. This report provides an overview of actual expenses alongside the budget that was set for the month. Board members can see at a glance how the organisation is progressing in comparison to the budget that they approved at the beginning of the year. They can also see what is left for the rest of the year and if there is enough money for what is planned to come. The Unspent Budget report is also critical in tracking grant funding. The bulk funding from the grant is budgeted across the funding period in the report. Then each month it is easy to compare it to the actual spent and gives a picture of any over/under spending. 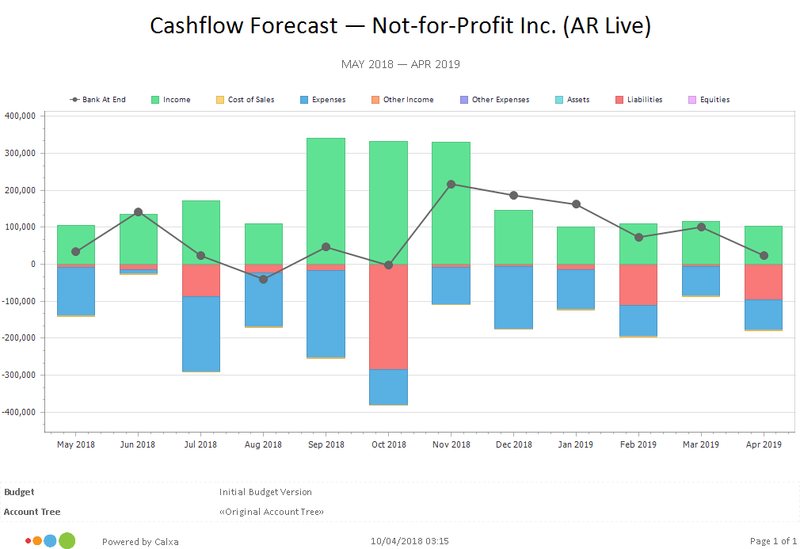 A Cashflow Forecast Chart gives an overview of how your budgeted income and expenses are affecting your cash in the bank. A good Cashflow Forecast Chart should show the predicted bank balance compared to the inflows and outflows. Although a chart may appear to be very simplistic, this is a chart that everyone understands. Your board will be comprised of people from all sorts of backgrounds, so keeping the information concise and simple is very important. Information can never be laid out too simply. If a board member wants more detail (and there is always one! ), you can provide a detailed forecast with numbers. 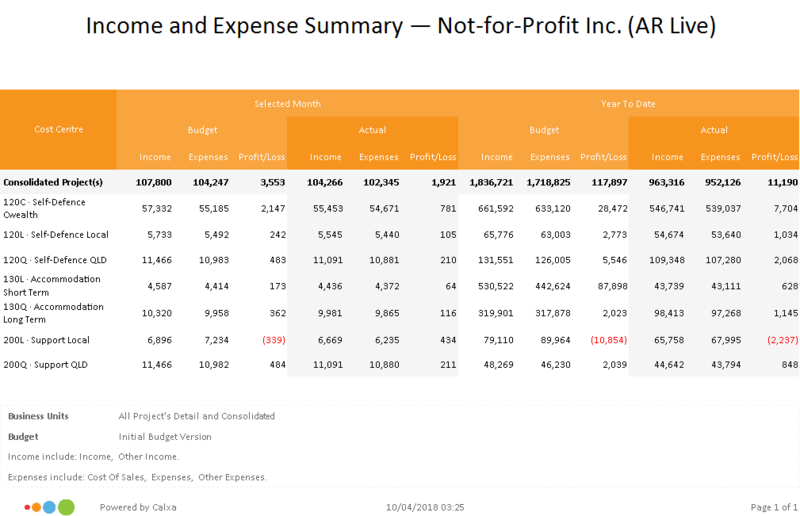 Also, more detailed information on expenses can be included after the main summary graph. Simply use a separate document to include these additional data. Board members will want to see how your projects are progressing with a break-down of the income and expense by project. This provides more detail than the Unspent Budget report and is just enough detail for the board members to assess the progress that the project is making. Here at Calxa we’ve made it easy for you to create all the reports that you need for your upcoming board meetings. 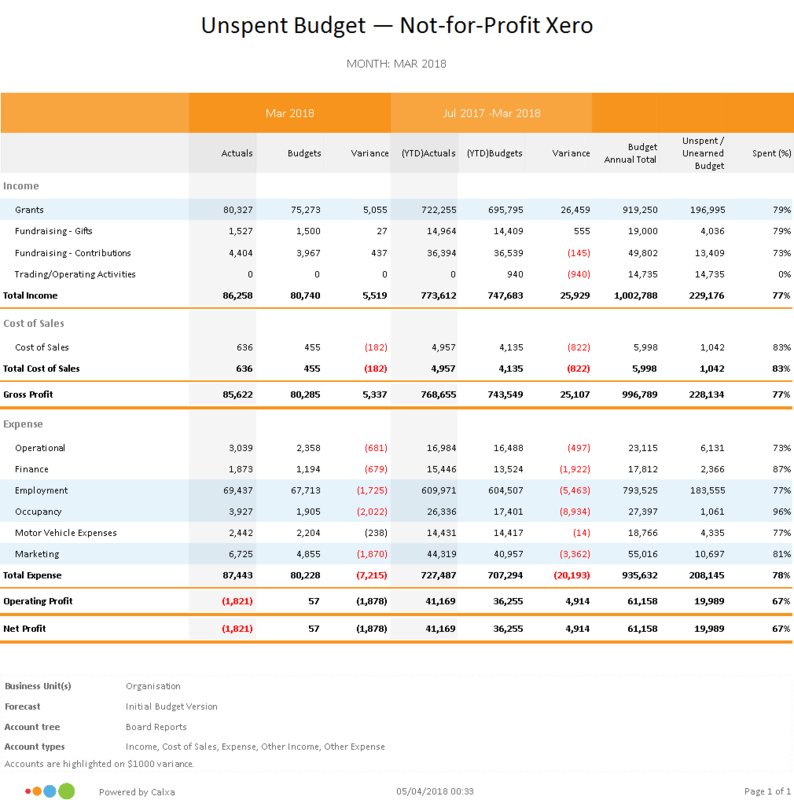 Just link to your accounting software, add your budgets and start creating your board report. We’ve created a video showing you How to Automate Board Reporting. This video talks you through what reports you can create with Calxa and how to automate their creation whenever you have a board meeting coming up. There is also a corresponding blog on Automating Board Reporting, so make sure to have a read too. We work closely with NFPs and have helped over 1 thousand NFPs with their reporting through our donation program, so we understand what you need for your reporting. Furthermore, Calxa gives you enough flexibility, as every NFP is unique. We have a range of reports that you can choose from depending on your needs. Find out more about how we help NFPs to create reports here. Whatever way you end up creating the reports for your board meeting, whether automated by Calxa or not, remember to include your passion. Passion is not something that can be measured in a graph or a table in a board report, but it can be felt when a report is read and/or presented. So, make sure to keep in the forefront of your mind why you do the work you do and whose life you transform by working at your NFP.